ST. PETERSBURG, Russia (AP) Aziz Bouhaddouz, head in his hands and face buried in the turf, was probably unaware of the opposing players and coaches swarming all around him in jubilation. Some teammates tried to console him, but it did little good. 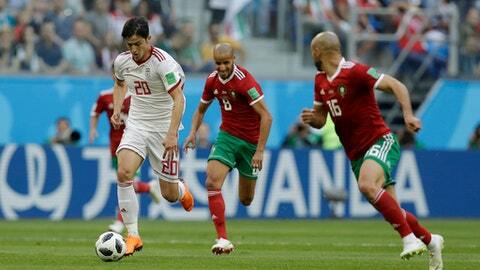 In the second dramatic finish to a World Cup match on Friday, Iran was gifted a 1-0 win over Morocco in Group B because of Bouhaddouz’s own-goal in the fifth minute of injury time. Only on the field as a 77th-minute substitute, the Morocco striker dived to reach an in-swinging free kick from the left and glanced the ball past his own goalkeeper inside the near post. ”We were crucified,” Morocco coach Herve Renard said. It was Iran’s second win in 13 matches at the World Cup, and Asia’s first since the 2010 tournament in South Africa. Showing just how much it meant, Iran’s players threw coach Carlos Queiroz into the air after the final whistle. They hugged and danced, savoring the best moment of their careers. Back in Iran, locals poured into the streets in celebration. Considering Spain and Portugal are the other teams in Group B, the match in St. Petersburg was regarded as a must-win game for the two outsiders. The result has already left Morocco struggling to stay alive in its first World Cup in 20 years. Renard said his team ”fell into the trap” set by Iran, which sat back and relied on the defensive strength that carried the team through Asian qualifying by conceding only two goals in 10 games. Morocco started well but then faded. So maybe it was mental exhaustion that led to Morocco conceding two fouls, one quickly after the other, in injury time. After the second, wide on the left, Ehsan Haji Safi whipped over a cross between the goalkeeper and the retreating defenders. Bouhaddouz, covering the near post, dived full stretch. He couldn’t believe where his header ended up. There was an explosion of joy among the Iran squad as coaches and substitutes leapt out of the dugout and sprinted onto the field to celebrate with the players. Suddenly, Iran’s blighted and frustrating World Cup buildup – the scrapped friendly matches, the sportswear sanctions from the United States that prevented players from wearing their favorite soccer shoes – didn’t matter anymore. There was also a late goal in the first match of the day, with Uruguay scoring in the 89th minute to secure a 1-0 win over Egypt. Iran would likely secure a first ever place in the knockout stage at a World Cup by beating Spain on Wednesday, though Queiroz is expected to play for a draw in Kazan. As for the Moroccans, they cannot afford another slip-up against Portugal in Moscow on the same day. Morocco: Most dangerous on the wings, through Hakim Ziyech on the right and Amine Harit on the left, during its strong start to the game. Ziyech, an Ajax playmaker, was billed as Morocco’s best attacker but he floated in and out of the game and embarrassingly missed an attempted shot completely when teed up for an early chance at the edge of the area. Iran: Omid Ebrahimi did a crucial job as a marauding shield in the midfield, protecting what was already the strongest international defense in Asia. Iran remains unbeaten in competitive games since the 2014 World Cup, when it only lost to Argentina because of a late winner from Lionel Messi. The vuvuzela is back. Well, almost. A dull droning noise from air horns blown by fans swarmed the St. Petersburg Stadium throughout the game. It revived memories of the vuvuzelas that were the soundtrack of the World Cup in South Africa. After it was initially unfurled, during the first half of the game, there was a brief commotion as it was put away. It then remained unfurled for the remainder of the first half. Then, in the second half, the banner moved up the field near the other goal.